from classical to avant garde. Greenside Emerald Theater, Edinburgh Festival Fringe. Reviewed by Lucy Komisar Aug 7, 2017. Brandon Lawrence, soloist Birmingham Royal Ballet. Photo by Garry Platt. This year’s International Choreographers’ Showcase had major European and American ballet soloists and the iconic post-modern choreographer Douglas Dunn, who danced with Merce Cunningham’s company. As one expects from Dance Forms, there were some very fine pieces. Of eleven, I selected these six. Arms swinging, body twisting, muscles rippling, Brandon Lawrence, soloist with Birmingham Royal Ballet performed “Angel.” Are his bent arms wings and his high kicks flight? Indeed, he seems godlike in this improvised piece driven by electronic music by a Massive Attack (Mad Professor Remix) concept and directed by choreographer Susana B. Williams, who also helms Dance Forms Productions. In “Singular Moments of Unraveling Truth” choreographed by the two dancers, Kathy Diehl and Leanne Rinelli move to a liturgical sound. In black leggings and gray tunics, their fluid bodies combine bends, high kicks, and twists with slow moves of arms and sweep of bodies. Sometimes they hold positions kneeling as in prayer or hands held up the simulate prayer books. It is a graceful and supple performance. The piece premiered at Artisan Works in Sept. 2015. Essen. Photo by Garry Platt. 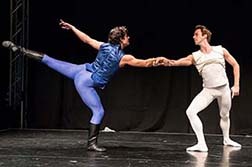 Rainer Krenstetter, principal dancer with Miami City Ballet and Breno Bittencourt, formerly principal dancer with Aalto Theater Essen performed “Supreme” of Né:Roi, choreographed by Ken Ludden, director of Margot Fonteyn Academy of Ballet. This Edinburgh premiere is the excerpt of a full-length ballet on the subject of destiny. The two classical male dancers do pas de deux with lifts that they might do with female dancers, and they are utterly natural, not campy. It is a treat for lovers of classical ballet. Lots of high turns and kicks in air. The violin music is from an original composition by Australian David Pyke recorded with the Moscow Philharmonic. The result is an elegant highlight. “On Acis” by post-modern choreographer Douglas Dunn starts out classically, to the sounds of opera lieder inspired by the story of “Acis and Galatea.” Dancers Emily Pope and Paul Singh do playful jumps and turns. Then Dunn, a comic Cyclops in leather vest and pink skirt, arrives on stage to challenge them with a lighted baton. A good-natured romp with Dunn doing the jokey bits he is known for. This is an Edinburgh premiere. Yun-Chen Liu and Palmer Matthews. In “Fine Without Me/You?,” Yun-Chen Liu and Palmer Matthews dance to a French love song, “Je t’écrirai” [I will write to you] by Alain Leamauff. In this charming piece by choreographer Jin-Wen Yu, their bodies connect, pull apart, come together in spirited moves to a pop rhythm. It is an Edinburgh premiere. “Unearthing” by Leanne Rinelli, which she performs with Laura Corral, Marina Garbalena, and Michelle Pacillas, is an abstract piece done to electronic music by Apparat. This is an excerpt of a work that premiered in El Paso, Texas, in Nov. 2016. The music is “On Oath” by Andy Stott. I liked the angular almost robotic movements, reaching and bending, arms pulling as dancers stretch and arch on the floor. It’s a very fine modern moment in Susana B. Williams’ purposeful and eclectic collection.